I have recently watched a documentary that was posted on Facebook by a friend on the effects of the quantity of animal protein in our diet and the negative effects that it has on our bodies. I am not going to go into a lot of detail on the video’s contents and my thoughts. I will just briefly say that the video was most definitely an encouragement to me to be more diligent in my diet. It really got me thinking. The video suggests a vegan diet to prevent and cure disease. I do feel that there is very legitimate claims behind this and without a doubt in my mind food definitely impacts the wellbeing of our lives. I do think that there is much to consider in the vegan’s diet. I believe that we, Americans, do not eat enough raw whole foods and it shows in our health and wellbeing. I personally am not a vegan and am not planning to go that route. While I found this video to have a very positive effect on the way I viewed food and my personal health and situation I did not agree with the entirety of the content. I wanted to share a little info on Quinoa and share a recipe with you. Just because I love quinoa! Is it hard to make? No! Just add to boiling water. What are the benefits of quinoa? In saucepan combine 1/2 c quinoa and 1c water. Bring to boiling; reduce heat. Simmer, covered, about 15 minutes or until liquid is absorbed. 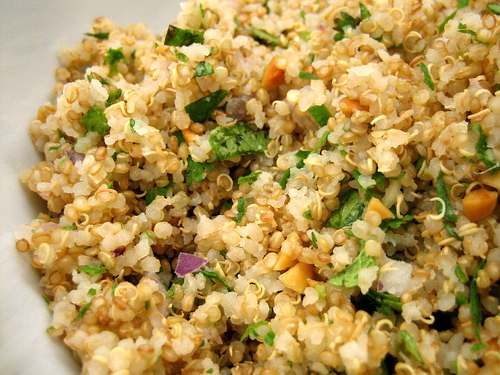 Place the quinoa in a bowl and let chill in the refrigerator. Add *vegetables to the quinoa and stir. *you can add any fresh veggies that you like some ideas that aren’t listed above are: garlic, red pepper, green olives, tomato. My quinoa comes pre-rinsed. If you buy quinoa be sure to find out if it needs to be rinsed before cooking.